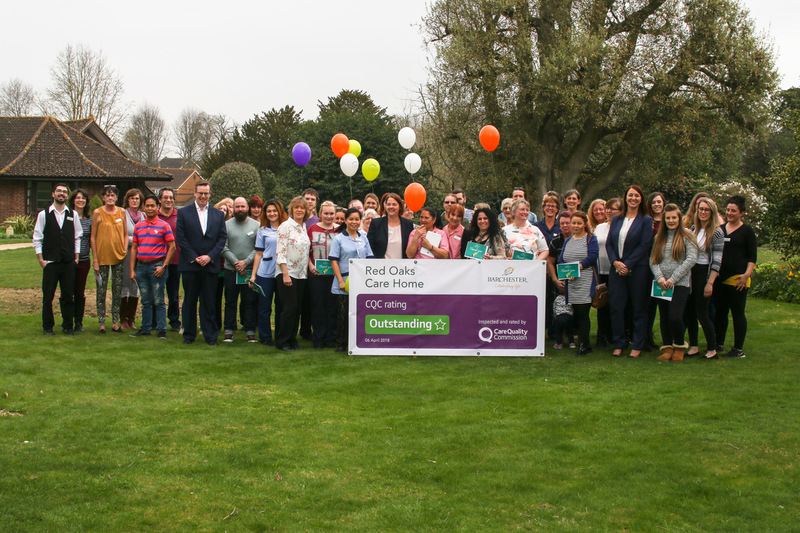 Linda Ryan, General Manager at Red Oaks celebrates the ‘OUTSTANDING’ award with her team in the gardens of the care home. Staff and residents at Red Oaks Care Home in Henfield, West Sussex, are celebrating their recent Care Quality Commission inspection rating, where they scored an overall ‘Outstanding’ after being reviewed for a safe, effective, caring, responsive and well-led service. Currently only 2.4% of England’s care homes, domiciliary care agencies and hospitals have an overall ‘Outstanding’ rating , so Red Oaks has been ranked among the best in the country for the quality of the services it provides. “I’m very proud of the whole team. From our hospitality teams, to our activity co-ordinators and our dedicated carers and nurses contribute to the level of care we are able to provide. Passionate about the residents in our care are the key to our fantastic result”.